Free Shipping Included! Becozier Office Chair Mat,Great Vinyl Carpet Mat with Studded Design and Clear Body, Perfect Odorless&BPA Free Protector for Carpet Floor in Home or Office,36”×48” by Becozier at Momiji Studios. MPN: ZH-709. Hurry! Limited time offer. Offer valid only while supplies last. 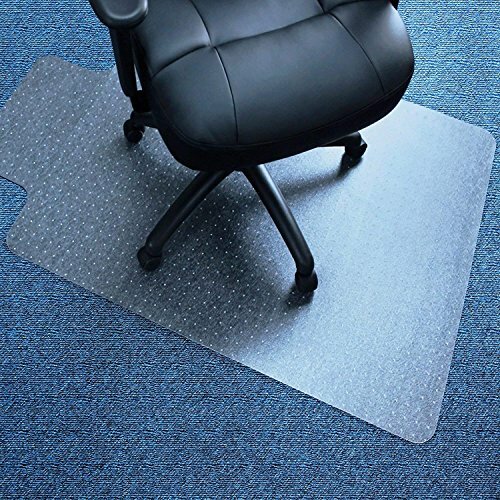 Becozier Eco Office Chair Mat Protect your carpet, stay mobile, and preserve a healthy indoor environment with Becozier's Eco Office Chair Mat. Protect your carpet, stay mobile, and preserve a healthy indoor environment with Becozier's Eco Office Chair Mat. -Protects your carpet from chair casters. -Perfect for home or office use. -Low friction and smooth material allows for smooth gliding. -A special-shaped lip covers the floor under the desk for when your chair is pushed all the way in. -Eco friendly material that is durable and easy to clean. material may take a few hours to return to its original shape once unpacked. 1.Unpack the chair mat, locate it with the textured side up. 2.Try to press it with your foot, make sure it's attached firmly on the carpet. 【Stay In Place】Move your chair casters freely while carrying daily tasks and without worrying about the stability since the special studded underside could hold the mat firmly on carpet. 【100% Indoor Friendly】Made from environment friendly long life polypropylene which is 100% odorless, BPA and toxins free. Ideal for a healthy indoor environment. 【Ideal For Protection】Not only the tough material, but the special lip design could provide a biggest coverage for you carpet which will make best protection for your carpet. 【Keep Flat in Long Life】It's easy to keep it flat. Just simply unpack and locate it to the low or medium pile(MAX:0.6 pile) carpet and try to push all the studs into carpet. Then you get a nice flat chair mat. 【RISK FREE PURCHASING】Although we do believe that you will never regret to own our chair mat, we still promise to you that we'll return all your money back if there is any quality problem. If you have any questions about this product by Becozier, contact us by completing and submitting the form below. If you are looking for a specif part number, please include it with your message.